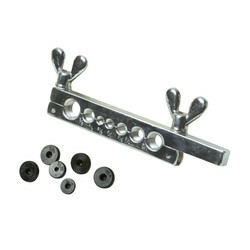 Includes: flaring bar, 45° screw-type flare press, and 7 x double-flare dies: 3/16", 1/4", 5/16", 3/8", 7/16", 1/2" and 5/8". 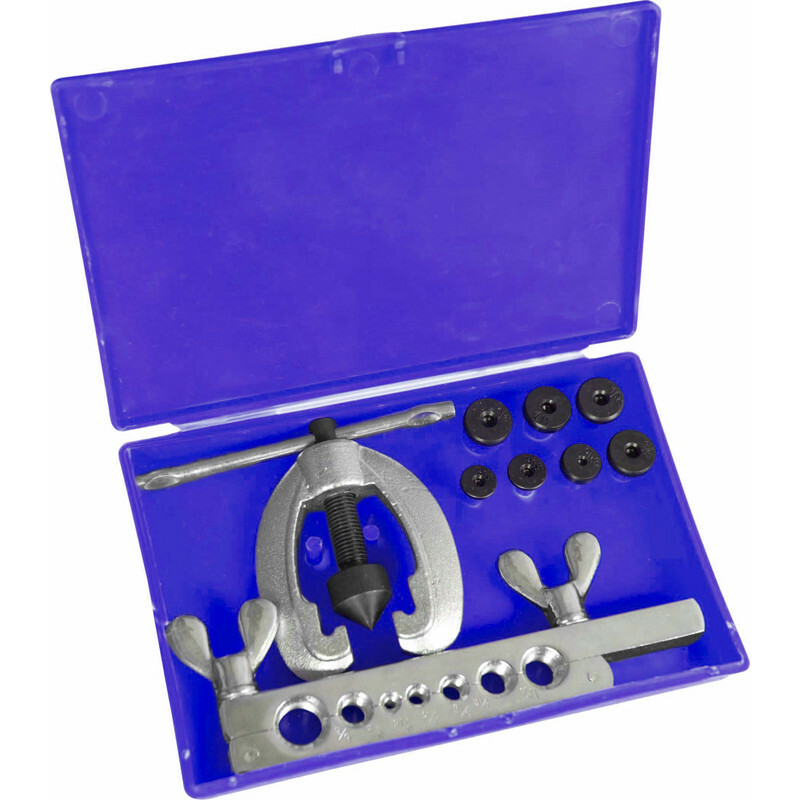 Flaring Tool Kit is rated 3.1 out of 5 by 17. Rated 4 out of 5 by Athan75 from Do the job that you want I bought this with a little bit of concern about the quality (comparing the price) but it came just the opposite that I thought that will be. It's a good product for good price. 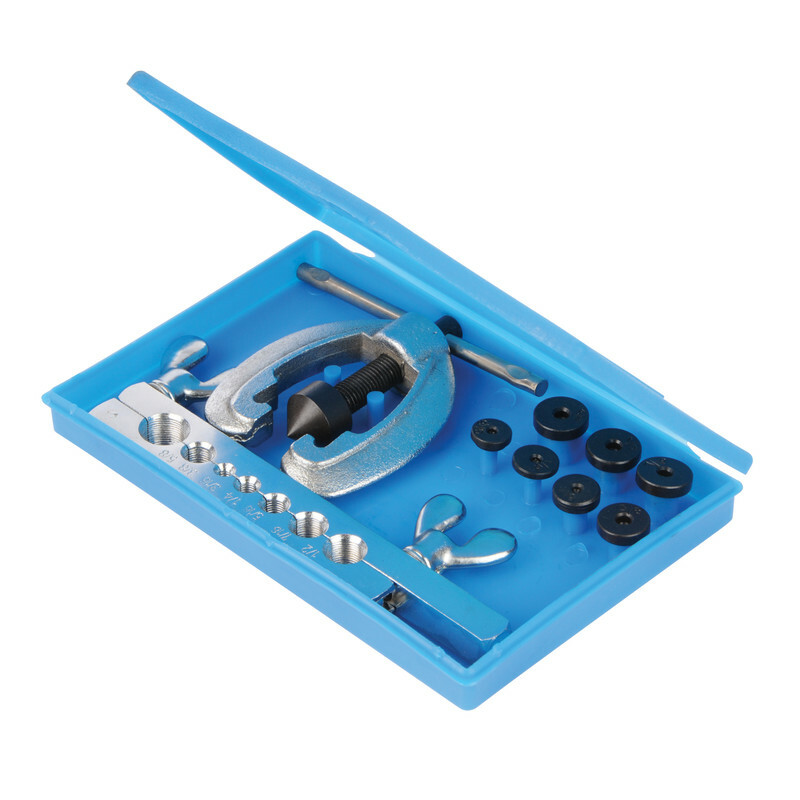 Rated 1 out of 5 by Stoker from Cheap but a bit too nasty Tried one of these on car brake lines with very poor results, returned for refund and purchased a much better tool elsewhere. May be ok on larger copper piping but overall quality of tool left a lot to be desired. Best avoided. Rated 3 out of 5 by DIY car mech from Cheap and cheerful but it does the job ...after a little practice. If you look on Youtube there are several tutorials for the same kit under various names (and prices). First off: THROW AWAY THE INSTRUCTIONS that come with the kit - they are wrong! For auto brake lines you need a double flare (single flare is for low pressure). Use the FLAT side of the flaring bar first, set the tube slightly proud of the bar and file it down flat. Clean out the tube and put a slight chamfer inside with a sharp knife. File a slight bevel on the outside, keeping it equal all the way round. Now turn the bar over and use the flared side. Use the black adaptor, lay it on the bar and set the tube height equal to the step on the adaptor and clamp it up - NOT THE 0.5mm IN THE INSTRUCTIONS Put a drop of brake fluid on the adaptor and insert it into the tube Fit the flare tool onto the adapter (keep it square) and tighten it until it stops Remove the adaptor and you should have a bubble end Refit the flare tool and put a drop of brake fluid on it and do not over tighten, use just enough force to get a slight flare. Rated 1 out of 5 by Cam11jb from This is not a good product I bought this item with the expectation a putting a double flare onto brake brake pipes. A single flare was possible but control for the double flare was not precise so I did not continue due to the risk of leaks - I hope to get a refund as I have already ordered another.